I want to introduce you to Robert. 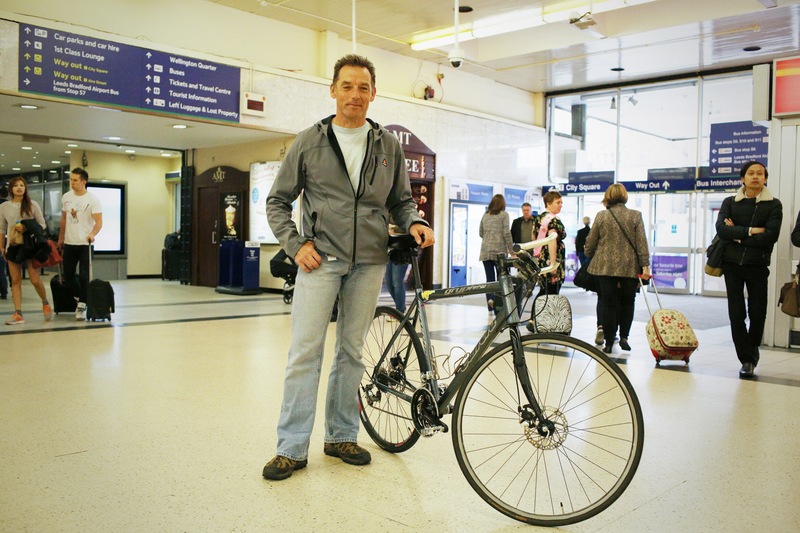 I met him when I arrived at Leeds Station – I saw his bike and and thought ‘Le Grand Depart!’. Robert was on his way out for a day trip but had ten minutes before he caught his train. We had a great chat and Robert told me his amazing story and how he was alive despite all odds. He is now someone having adventures and creating exciting goals for himself, and completely living life to the full, every single day. What a way to live life! I was so happy to have met Robert and felt inspired for the rest of the day. Meeting him reminded me that stepping out of your comfort zone and taking a risk creates all sorts of possibilities in your life and he reminded me of why NOWportrait exists! Saying hello to someone new and taking 10 minutes for a chat is inspirational. Give it a try! I saw Robert at Leeds Station and asked if I could take a portrait of him and his bike because in a few days time Leeds is hosting Le Grand Depart for the Tour de France and I liked the bike link. Robert had the most amazing story. 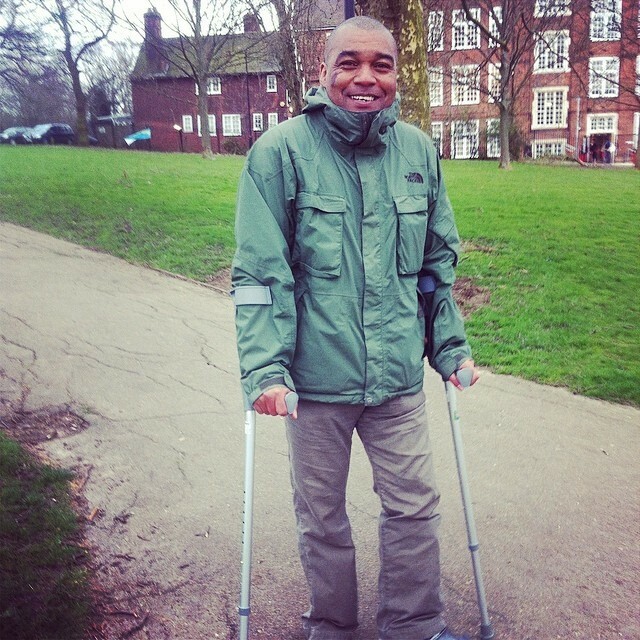 Three years ago he had a terrible accident which left him in a coma and fighting for life. He used to be a champion cyclist and rode all over the world and his surgeons said he’d never be able to do that again. But, he was determined! Despite all odds he’s back on his bike and living each day like it’s his last. I asked what was on his list of things to achieve. He told me ‘well, I’ve never been married!! !’ He’s also planning to cycle all the way around Australia next year. 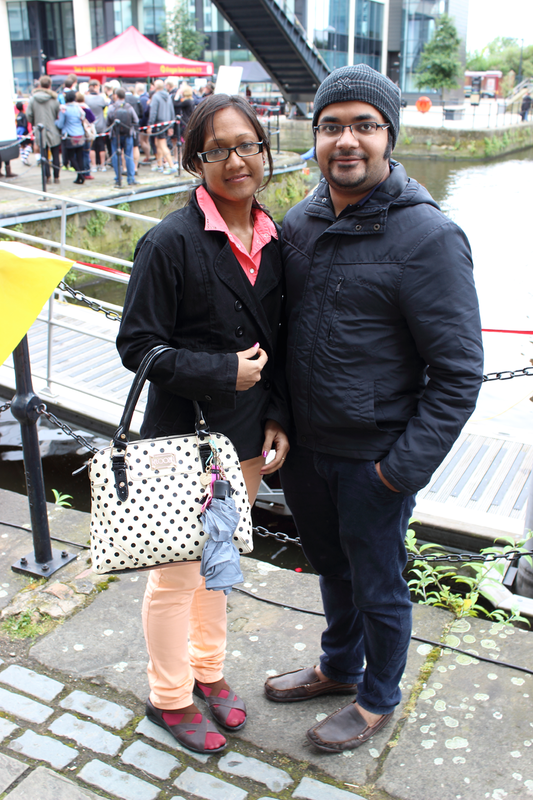 He’s the first person I’ve met today in Leeds and I’m so pleased to have met him. What an inspiration! If you live in London and would love to come along to a meet up – you’re in luck. On July 6th we have our 3rd NOWportrait meet up and we’ll be starting from Lancaster Gate. It’s a great way to meet like-minded people and to share the strangers you meet! Check out the event page to register and join in. And join the conversation in the Facebook group, and on Twitter or Instagram #NOWportrait. If you’d like to organise your own NOWportrait meet up where you live, drop us a line and we’ll support you to do that wherever you are. Yesterday I met Roshid…and Sparky. I started talking to Roshid as I saw little Sparky literally leaping towards a motorbike that was driving past them and almost taking Roshid with him! We started the conversation with my observation at how ambitious his dog was and from there we chatted for a few minutes and they both kindly posed (thank you Sparky!) for a portrait. 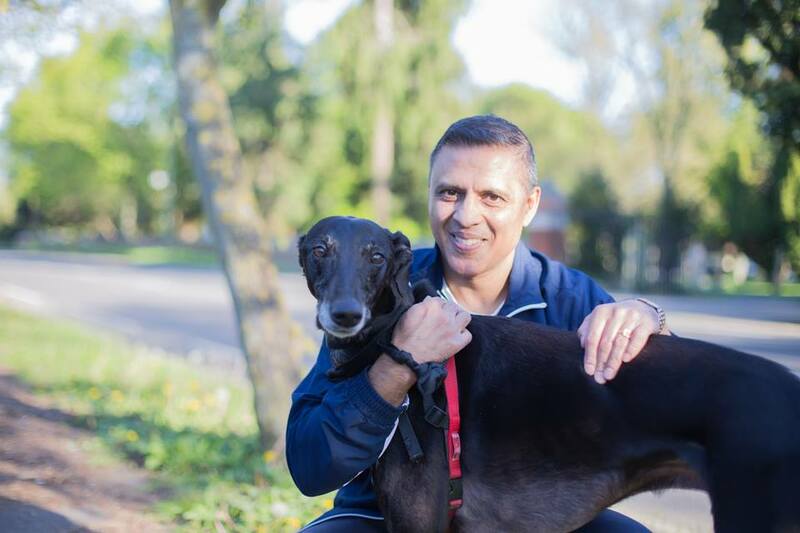 Roshid is an engineer and yesterday he finished work earlier and took his dog for a walk in the lovely weather and I was very lucky to meet them both. While talking I found out his jobs involves a bit of travelling, including Sicily, in Italy, where my mum is also from! I met Sarah and Fraser last night at an FDT event. 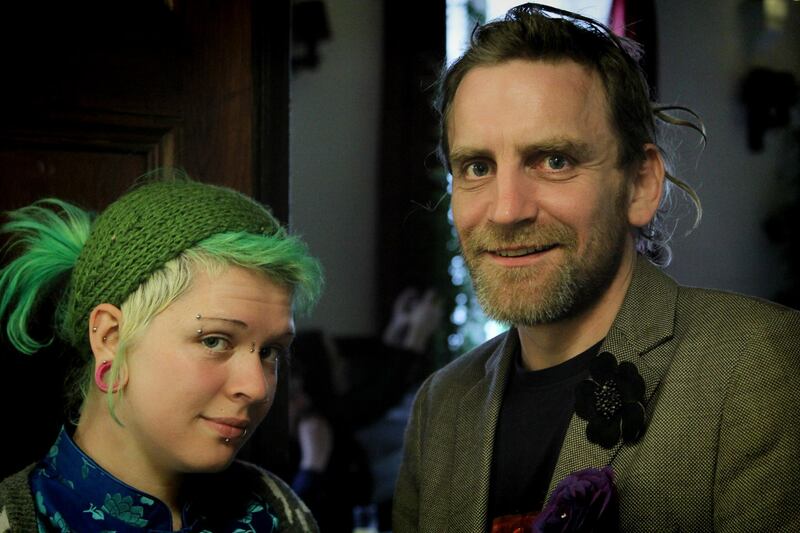 They are part of Creative in Callander, which is a non profit community based co-operative craft and retail outlet. 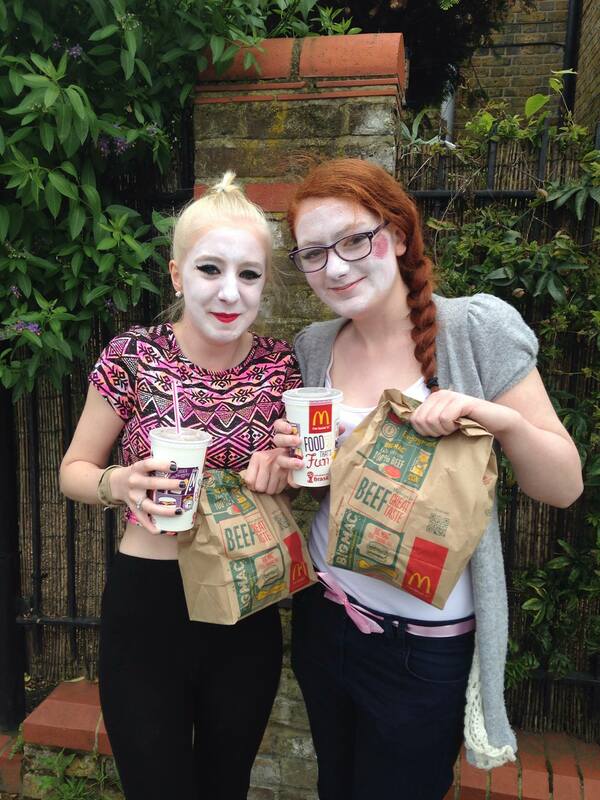 I couldn’t help but ask Michele and Georgina for a photograph as they passed me in the street today with their faces painted white. Curiosity got the better of me! It turned out they were working on photography project for school to demonstrate their dark side which is why they had painted their faces so ghoulishly. They were just on their way back from grabbing lunch at Mcdonalds and were delighted to become part of NOWPortrait! have a friendly chat, what was it about them as a couple of people that inspired you to take their portrait? Let them know! Grab your camera, meet a stranger, say hello! Did you know that anyone with any camera can take part in #NOWportrait? We love to see photos taken on camera phones, ‘point and shoot’ compact cameras, SLRs, medium format etc etc. Even pinhole cameras (we’ll be very impressed indeed if you do a pinhole camera photo!!!) And both digital and film are welcome. The portrait of Lydia below was shot by photographer Katharine Peachey, on a film on a medium format camera (Contax 645 – Kodak Portra) which meant Katharine uploaded her digital scans a few weeks after she met Janet. And the portrait of Bert was shot by hairdresser Conor Kelly on an iPhone which he shared with us on Instagram #nowportrait. However you take photos, NOWportrait is about being out there making a great connection with someone you’ve never met before. This week who will you meet? We’re encouraging you to join in the project and share the people you meet with the #NOWportrait community in the Facebook group or on Instagram #nowportrait. We can’t wait to see! To get started head out into your local community, find someone you’ve never met before and say hello. And if you’re stuck for inspiration, next Wednesday 14th May is ‘Receptionist’s Day‘ so that could be a great way to start. Or, if you’re feeling far more risqué, next Thursday 15th May is ‘Nylon Stocking’s Day‘ 😉 Add the hashtags #receptionistsday or #nylonstockingsday to your #nowportrait when you share. For our latest updates follow us on Twitter @nowportrait and on the NOWportrait Facebook page too. 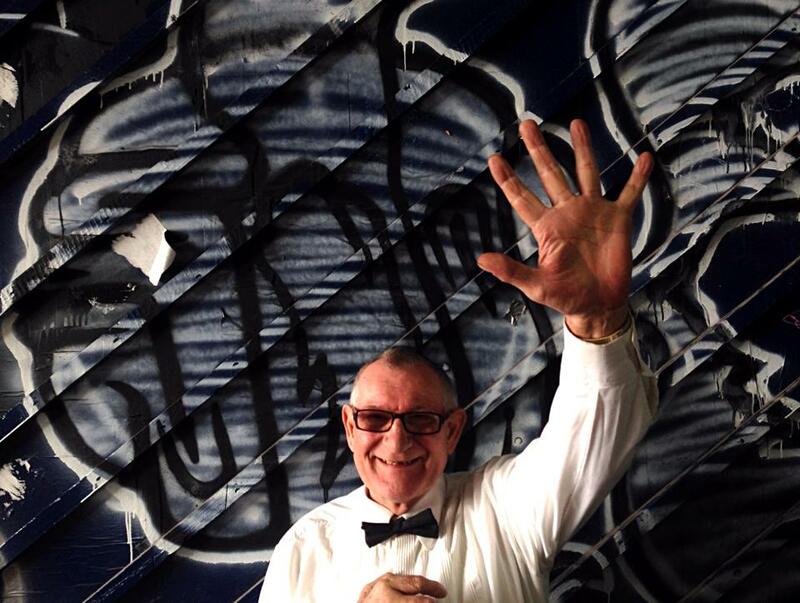 Hello and welcome to #NOWportrait! I don’t know about you, but it struck me that we pass so many people by without even noticing them; neighbours, people in the local community, people we see in the same train carriage, every single day, for years. Maybe there’s a glance of recognition between each other, perhaps a shy hello, but how often do we start a conversation? Maybe we’re heading to a future where our daily chats with strangers only ever take place in online communities like Twitter or Facebook. NOWportrait is based on a simple idea; meet a stranger, have a conversation, photograph a portrait, capture their story and share! 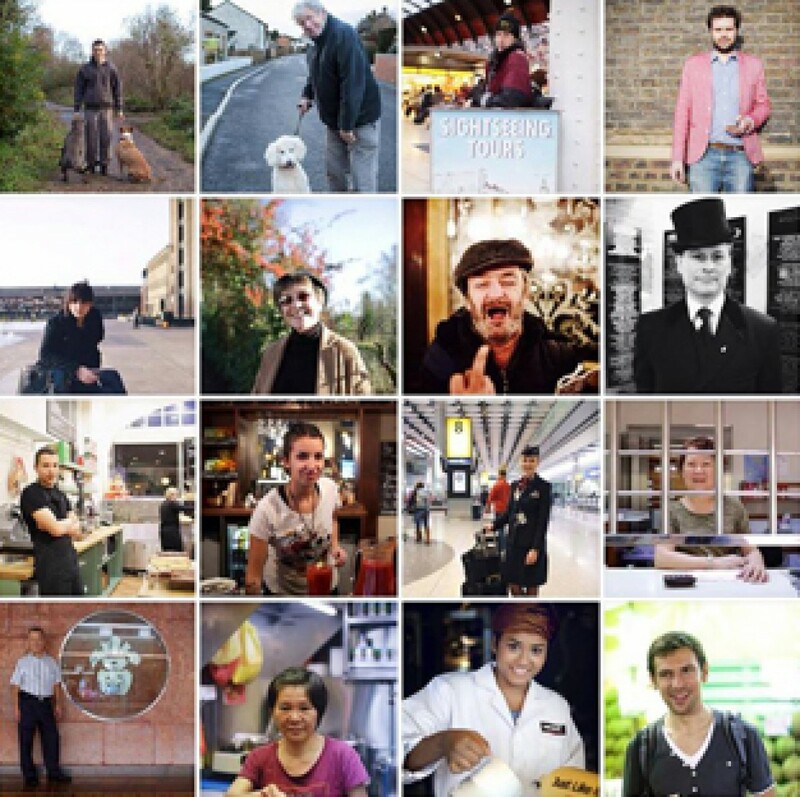 The project was launched on March 8th 2014 and during that weekend 37 photographers took part and met and photographed over 70 strangers, all over the UK and as far away as Iraq. The concept is easy! Meet a stranger + say hello + capture a story + take a portrait + share! Anyone with a camera can take part, whether it be a camera phone, a compact camera, a dSLR or film camera. You don’t have to be a professional photographer, in fact our youngest participant is 5 and took his portrait on a children’s digital tablet. NOWportrait is all about having a chat and making a connection with someone unexpected. Even if they say no to a photo you might find that you end up having an amazing chat – and that’s great! If you do get a yes, have a chat whilst you take their photo and find out something interesting about the person you’re photographing. If you prefer to use Instagram (or another image sharing platform/ app), please do share there too! I’m Lucy Williams, I’m 41 and a wedding & portrait photographer and I set up NOWportrait in February 2014. I’d been shooting a stranger photography project for myself which I’d started started because I was petrified to do it! I knew the only way to conquer the fear was to face it head on. At first it was very scary and I walked past the first person I photographed 5 times before I plucked up the courage to chat with him. I quickly realised that meeting someone new was an uplifting experience and the sense of connection I got after chatting with someone, even for just 5 mins, was immense. I began to share my stranger portraits in my Instagram gallery and received many comments from other people on Instagram saying they wished they were brave enough to meet and photograph strangers too. I thought if there was a project that inspired people to do just that it would be brilliant. And NOWportrait was born. NOWportrait has grown to a small team of people including Richard Chambury, Cally Sheard and Kate Boswell and we are very excited about creating a space for people who are meeting and photographing strangers to connect with other people doing the same thing, all over the world. NOWportrait is a growing community of people meeting strangers and sharing online in the Facebook group. We also hold regular meet ups for people to get together and share the NOWportrait experience. And later this year (2014) there will be an exhibition and photobook of selected portraits taken during the launch of the project (March 8-10th) Both the prints and the book will be available to buy and all profits will be donated to support UK mental health charity MIND. Why support a mental health charity and why MIND in particular? I wanted to raise money for MIND because I experienced depression for most of my twenties and early thirties and I remember feeling like a stranger in my own life, and alone, even though I was surrounded by people who loved me. Taking 10 minutes to talk to a stranger could change someone’s life forever. And taking a creative risk, getting out of your comfort zone and connecting with a stranger could change yours. NOWportrait aims to be a global community of people connecting with people through photography, with events to meet up with others and opportunities to raise money for mental health charities around the world. Head over to the NOWportrait Facebook page and LIKE us. And lastly, share the project with everyone you know, especially those who are up for a creative challenge, meeting new people and would love to shape a new future through photography.